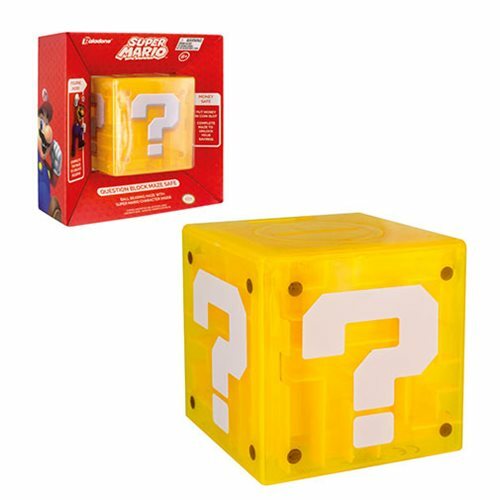 Take on another Super Mario themed puzzle and unlock your savings with this super cute Super Mario Bros. Question Block Maze Safe. Complete the puzzle, and as soon as you move the ball into the lock you'll have access to your coins. Features a Super Mario figurine inside, which you can unlock the first time you solve the puzzle. This Super Mario style safe has a coin slot where you can place your savings, and is in the shape and design of the iconic Question Block from the Super Mario games. Now you can follow in your favorite plumber's footsteps and collect some coins for yourself! Bright yellow, this fun safe is a great gift for lovers of the Super Mario Bros. video game series as well as retro gaming in general.